Update: Got a mail from snapdeal security team, and this vulnerability has been fixed. I was randomly browsing through shop.airtel.com and discovered a XSS vulnerability. This involves one of the simplest forms of XSS attack, known as end title tag attack. This vulnerability is present in such web pages where the search string is directly put between title tags, without sanitizing it. Note: This type of vulnerability is blocked by Google Chrome’s XSS auditor, so use firefox to test it. 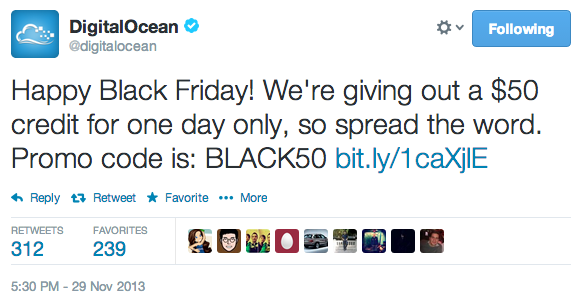 On the occasion of black friday, DigitalOcean offered $50 in credits (which is equivalent to 10 months free 512MB VPS plan). Lately, I’ve seen a lot of people using ad block extensions/addons to block ads on the websites. Such extensions/addons reduce the clutter a bit, hence provide a better browsing experience to the user. But on the other hand, many sites solely depend on the ad revenues in order to keep them running. In order to fix this problem, I quickly hacked a very tiny script which detects ad blocking extensions/addons. I’ve tested the script with AdBlock and AdBlock Plus extensions and it worked fine. Earlier, I demonstrated the XSS vulnerability in DealsAndYou (fixed) and now, I’ll demo a XSS bug on KoolKart.com. I’ll describe the whole process below. Step 1 – Writing a php script for saving cookie returned by injected code (cookie-stealer.php). 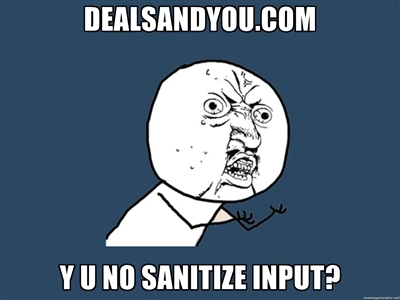 DealsAndYou, why you no sanitize inputs? Update: Dealsandyou has fixed the bug. Responded on twitter with a thanks.